Dynamic discounting can save your company millions of dollars by offering discount incentives for suppliers who accept early payments in exchange for discounts off of the full payment due. Dynamic discounting is an efficient way to optimize cash flow in a highly dynamic, real-time environment. In this low interest rate environment where returns on cash are difficult to come by, treasurers and financial executives can generate tremendous returns with a dynamic discounting program. Dynamic discounting is cost-effective and beneficial for the buying company and the vendors, since it allows for both parties to collaborate and transact via a vendor portal or supplier portal and generate substantial benefits. Dynamic Discounting is a program set up by the buying company that establishes a process by which buyers (customers) and sellers (suppliers) can “dynamically” alter the standard terms of payment in a highly dynamic, flexible, real-time environment. Dynamic discounting is a voluntary system where the buyer offers the vendor an early payment discount. This system dynamically alters the normal supplier discount paradigm where vendors offer the buying company fairly static discount terms on a “take it, or leave it” basis. Dynamic Discounting is an efficient way to optimize cash flow in a highly dynamic, real-time environment. With Dynamic Discounting, the savings to the buying company can be tremendous and the benefits to the vendor encourage a high level of participation. It also enables you, the buying organization, to offer targeted suppliers early payments in exchange for discounts on the payables due at a later date. These programs are a win-win for both the buyer and suppliers. Buyers can save millions of dollars by taking advantage of paying less for goods and services through an aggressive discounting program. The dollars invested in a dynamic discounting program generate a sizeable ROI. Suppliers can optimize their cash flow, reduce high borrowing costs and have predictability in the payment cycles. The amount of discount offered, what invoices it will be offered for and the timing of those offers are completely flexible. They can also be changed to fit your current cash strategy and to maximize your return on your short term cash investment. For instance, the discount offered can be changed as the cash flow position of the buyer changes. Additionally, the percentage of the discount can decrease as the transaction becomes closer to the normal payment date. Who Can Benefit from Creating a Dynamic Discounting Program? 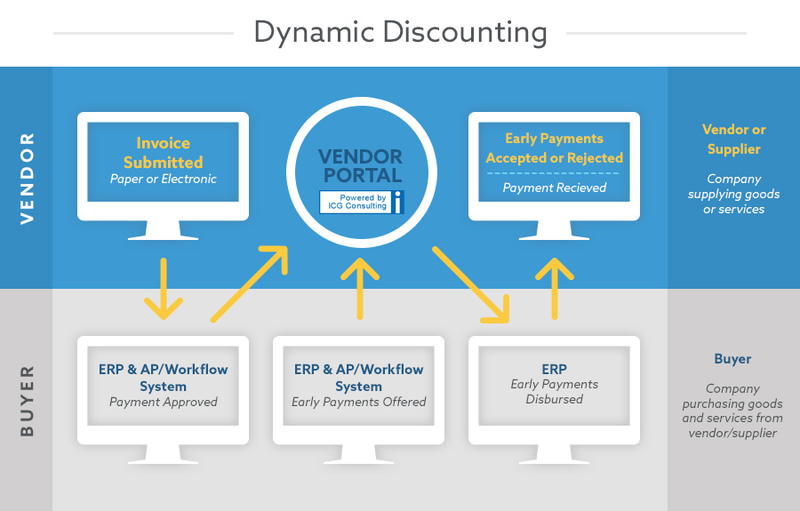 According to PayStream Advisors, “buyers who report achieving these discounts tend to pay their suppliers about 10 to 15 days before the invoice is due.” Since dynamic discounting allows for both the buyer and the vendor to maximize cash flow and generate savings, all parties gain significant financial benefits. Dynamic discounting is worth a look for every business that manages a significant number of invoices each month, but you must have efficient AP processes in place before implementing a dynamic discounting program. Some of our clients have justified upgrading to electronic payment processes for the sole financial benefit of implementing a dynamic discounting program. Since it’s important to have automated AP processes in place before launching a dynamic discounting program, the first step may be implementing a comprehensive vendor payments solution with a corresponding vendor portal. Every business has unique needs, so contact ICG now and let us help guide you through the process. What Can ICG Do for My Business? We often save companies millions of dollars annually, and we have the experience and capabilities to implement the right dynamic discounting solution for your business. ICG’s philosophy is unique, because we focus on improving the business you have already built. Most companies force you to join a vendor (or buying) network in which you are only allowed to do business with approved vendors. However, we enable your existing vendors by improving your current technology. You don’t have to join our vendor network or overhaul your entire system. Regardless of where your company is in the process of implementing AP/AR automation or electronic invoicing, we can help you reach your bottom line. Contact us to talk about next steps.